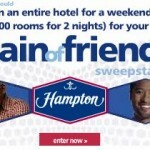 @HamptonFYI Enter to win an entire hotel stay for 200 of your closest friends. Eligibility: Open Only to Legal Residents of the fifty (50) United States and DC, Mexico, UK, and Canada (excluding Quebec), who are of legal age of majority in their jurisdiction of residence (and at least 18 years of age) as of June 1, 2010. 1) Book a Stay: Book a stay online at a Hampton hotel during the Promotion Period with the promotion code “FRIEND” or “COF.” Stay must be completed between June 1 and September 5, 2010. You will be entered in the Promotion on the day you make the booking. 2) Online Without Booking a Stay: To enter without booking a stay, visit hamptoninn.hilton.com/en/hp/promotions/hx_entry_form/index.jhtml?promo=friends. All online entries must be received by 11:59 p.m. CT to be eligible for that Daily Entry Period. Entry Limit: one (1) entry per person/email address for the duration of the Promotion Period, regardless of method of entry. Prizes: One (1) Grand Prize: two hundred (200) Be My Guest Certificates. Each certificate is valid for a one-night stay at a Hampton Inn hotel worldwide. Certificate valid for room rate and corresponding room rate taxes only on a standard room (double occupancy) and does not apply to incidental charges or gratuities. ARV US $22,600. One hundred (100) Daily Prizes (1 per day): eight (8) Be My Guest Certificates. One (1) winner per Daily Entry Period, except two (2) winners for the June 30, July 31, August 31 and September 4 Daily Entry Periods. Each certificate is valid for a one-night stay at a Hampton Inn hotel worldwide. Certificate valid for room rate and corresponding room rate taxes only on a standard room (double occupancy) and does not apply to incidental charges or gratuities. ARV: US$904 each (for the 8 certificates). Prize Limit: one (1) Daily Prize per household. I was notified that I was a daily prize winner on this contest. The amount of paperwork I got from them is overwhelming. I have never won anything this big before. I found your site searching for help on this. It freaks me out to give them personal info like my social security number. Do you think it is really safe? Also, on the tax issue, from reading on your site, I keep receipts and file for the amount of the hotel bill after the stays? Sound right? If it is real then yes, giving them your social security number is safe because most likely you will have to find a notary to sign and authorize the paperwork. They need your SSN because you will have to claim the prize on your taxes and so will the sponsor. This is a little different because it sounds like they are giving you vouchers to use at any of their hotels. You could still keep receipts or an idea of what the going rate is for the hotel you use and if the 1099 comes in higher you can claim the lower amount.